Reading is a pleasurable activity in which you can escape the reality and forget about your problems because why deal with problems when you can run away, right? But truly reading gives us so many opportunities to live other lives and experience unimaginable adventures outside our ordinary lives. Well, when I put it like this, it seems that being a bookworm is just simply an amazing thing. Wrong. 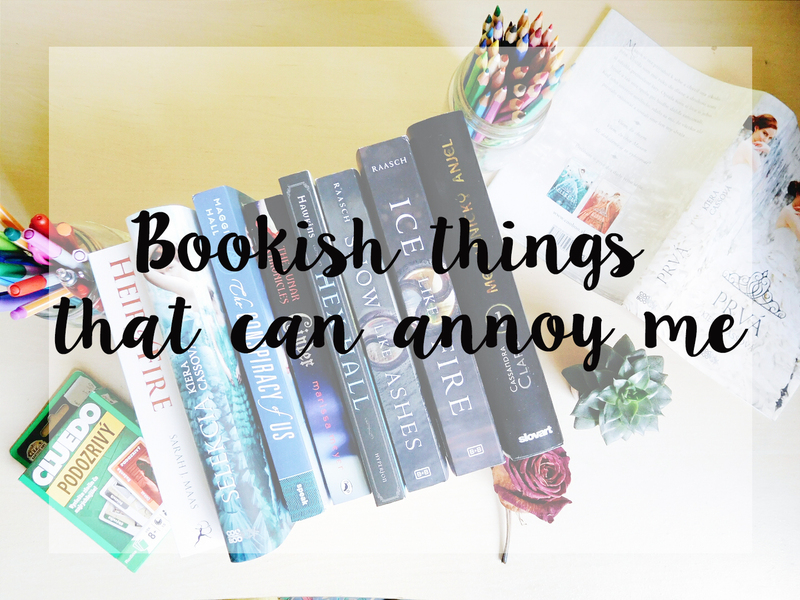 There are so many thinks we as bookworms have to deal with and sometime, they can be annoying. There is no other thing in the whole world that annoys so much as when a publishing house decides that it's okay to change the cover of books in the middle of a series. Now, imagine you have first three books with the original covers and then the rest has different covers. I know it may sound shallow but I like my series to look the same, because it looks better... and my OCD is happy. I mena, why would you change perfectly beautiful and amazing cover in the middle of a series??? Now I'm upset. Can someone give me an owl so I can calm down? Another thing that makes my OCD scream like crazy and tear its hair out is when I want to buy a certain book and then I will just randomly check if there's sequel in the same format and then I see that the measurements are not the same. I mean, yeah, I want to have sequel that is 3 mm taller and 5 mm wider than the first part. What if I took my eyes instead so I wouldn't have to see the disaster on my bookshelf then. I know, I know it may seem like exaggerating but I like my series to be the same format, it has to have the same cover and the same measurements because then it looks tragically. I was impatient and bought Ice like Fire with different measurements and I thought "Oh it's just a few millimeters, it's going to be alright!" Well let me tell you, it does not look alright. 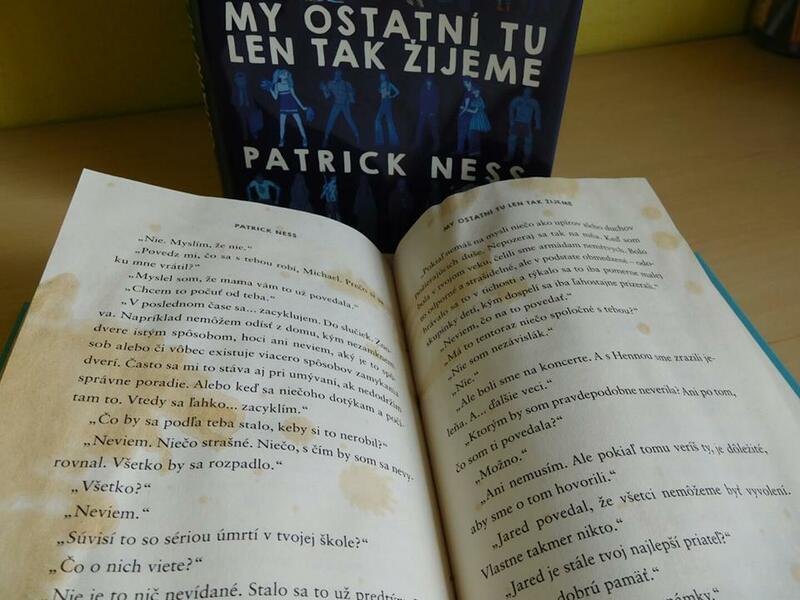 Though I'm okay with writing into my books, I most definetely am not okay with stains in my books. Let me tell you a story. About a month ago I was travelling home from uni by train and I was reading The Rest of Us Just Lives Here ( btw it's amazing book, go read it if you haven't already). So I'm fully into the story and suddenly something hot lands in my hair and on the passengers around me. After a second we realised that a man going through the corridor spilled coffee on us. And no he did not apologize. Now at this stage everyone tried to dry themselves and I just stared and my stained book. As you can see in the picture it was wrecked. You probably can imagine the amount of self-control it took for me not to burst into tears. It was almost impossible. This is my slovak edition of The Rest of Us Just Live Here and I was reading it on the train on my way home from uni when one clumsy guy walking through the aisle stumbled and poued his coffee over me and the guy sitting on the opposite side. The guy had it the worst because he had white pants and was quite dirty while I had a little bit in my hair but most of it was on my book. I didn't know whether I should cry or scream at the man who didn't even apologize. He just looked at us and walked away. #rude The worst thing is the smell. I don't have anything against the smell of coffee but this is some kind of cheap disgusting coffee. Now it's your turn, what things can annoy you? 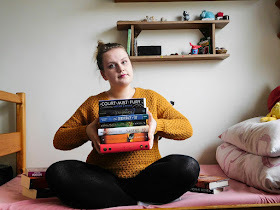 Do you need the books to be the same height? Did anything similar happen to you and your book? I hate it when covers are changed halfway through the series!! It's the most annoying thing on the planet. And I can't believe how rude that man was! Gosh. Not even apologizing? Some people. OMG I CAN'T BELIEVE THAT GUY SPILLED COFFEE ON YOU AND DIDN'T EVEN APOLOGISE. THAT IS LIKE A HUGE HORRIBLE THING. *pats your shoulder consolingly* I would've been absolutely devastated. D: I hate ruining my books. I once took Divergent camping and totally accidentally gouged a hole in the back cover. FOREVER SAD. And I've accidentally ripped pages from turning too fast. omg. I really hate damaging books. I makes me feel HORRIBLE. Wow a hole? What did you do?! :O But I hate damaging them too. Recently I got my Splintered back from a friend and one of the corner of the book was damaged. I tried to console the book that it will be okay. Ugh, yes, making books in a series different sizes is the worst! Everyone talks about cover changes, but no ever talks about how annoying the size thing is. I have the first 12 books or whatever in The Vampire Chronicles, and ok, I don't know if I'll ever actually read the latest one since it's been so long since I read the others, but I still want to complete my collection, but it's so huge compared to all the others! Urg, I soooo feel you. I'm not even as mad about the cover changes as long as the covers look pretty. Am I annoyed, yes, but it's not that horrible. The size is worse for me. I just need to see the series in one format. Definitely agree with these! Cover changes are the worst- at least midway through a series. If you want to re-issue new ones later, FINE, have at it- but don't make it impossible for my pretties to match! And I feel you with stains. They make me so sad. 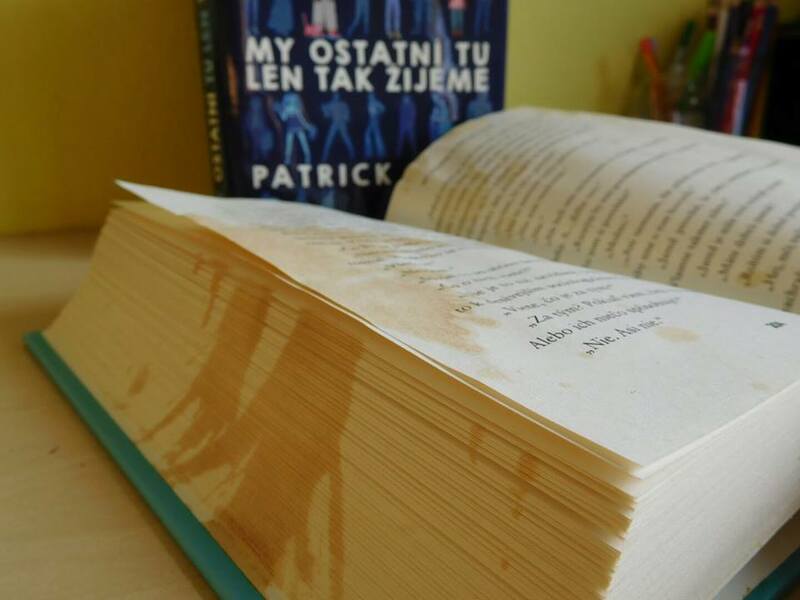 And if it is like, a stain that was THERE- nope, cannot even touch the book again! And on The Rest of Us Just Live Here... too sad. Book karma is going to haunt coffee dude forever. So at least there's that!